Some films aren’t destined for box-office glory, but for a surprisingly passionate cult status. Wet Hot American Summer, released in 2001 and written by Michael Showalter and David Wain, helped launch the career of comedy greats like Amy Poehler, Paul Rudd, Bradley Cooper, Michael Ian Black and Elizabeth Banks, among others. What it lacked in initial ticket sales, it has more than made up for in lasting appeal, with both a prequel and sequel series streaming on Netflix. This November, Wet Hot American Summer conquers a new medium as an original graphic novel written by Christopher Hastings (Adventure Time) and illustrated by Noah Hayes (Goldie Vance) with cover art by Joe Quinones (Howard the Duck). 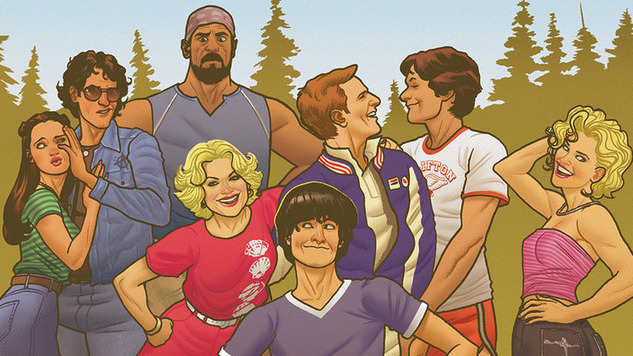 Check out the full synopsis for the all-new Wet Hot American Summer original graphic novel below, along with an exclusive extended preview of Hayes’ (not-final) interior art. Wet Hot American Summer hits shelves in November 2018. Camp Director Beth is relieved to have made it through week one of Camp Firewood in one piece…until the health department is called in for a surprise camp inspection! Now Beth, Coop, Katie, Andy, Susie, Gene, Nancy, Victor, Ben, McKinley, J.J., Gary, Gail and the rest of Camp Firewood have 24 hours to—literally—clean up their act by bringing the camp up to code or this will be the last summer the camp is open! Luckily, the camp counselors are all onboard to pitch in…if they ever come back from partying in town.